GBA Action Man: Robot Atak (Europe) in 26:41.88 by Qwerty. Action Man: Robot Atak is an action game, developed by Magic Pockets and published by Atari, which was released in Europe in 2004. Professor Moran is kidnapped by Dr. X, and it is up to the Action Force to bring him back. 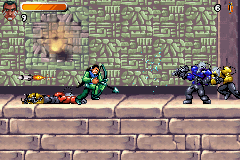 The playable characters of this game are Action Man himself, Red Wolf, and Flynt. Together, they beat up robots, punch dinosaurs, ride jet skis, and do other typical action-movie things along the way.